Being an evangelical Christian in 2017 can be a fairly daunting prospect. There appear to be so many challenges in wider society and in the wider church. Surely standing up for the gospel of Jesus Christ and proclaiming it in the world is more difficult now than it was in the past! Well, a little historical perspective can allow us re-evaluate our situation and encourage us by the inspiring examples of those who have gone before. It is for this reason I commend two recent books about nineteenth-century evangelicals. 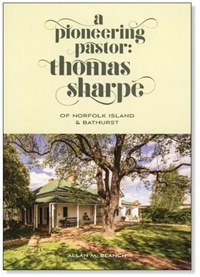 The first little book is Allan Blanch’s A Pioneering Pastor: Thomas Sharpe of Norfolk Island and Bathurst. Sharpe’s faithful evangelical ministry has been somewhat forgotten in our historical narrative of Christianity in colonial Australia. Sharpe was born 220 years ago in Yorkshire and was ordained in 1828, just 21 years old, for the specific purpose of Anglican ministry in Australia. He was first given postings on the outskirts of the Sydney basin and, in 1836 was the first person Bishop Broughton ordained priest. He was then sent out to Norfolk Island for five difficult years of isolated ministry to convicts and soldiers—two notoriously difficult soils for gospel sowing. Yet, with faithfulness and compassion, Sharpe continued in his task of proclaiming the good news to the inhabitants of the island. It was a ministry that had eternal consequences and for which many of the flock were genuinely appreciative. From Norfolk Island, Sharpe was made the first minister of Bathurst in 1841. This was before there was even a church in the town. Sharpe remained in Bathurst for the rest of his life and he oversaw the building of All Saints’ as well as the establishment of a school. In 1870 he retired as rector just as Bathurst was becoming an independent diocese. He was appointed the first Canon of All Saints’ Cathedral, a position he retained until his death in 1877. One of the wonderful features of Blanch’s biography is that he allows Sharpe to speak for himself through his journal. Blanch also provides important contextual background for the events—both ecclesiastical and social. This book is well-researched and easy to read. One of the aspects I appreciated in learning a little more about the ministry of Thomas Sharpe was the way his ministry was both ordinary and extraordinary. He preached, he prayed, he organised, he established new ventures, he faced opposition. Yet, at the same time, he stood firm and made great personal sacrifices for the sake of the gospel and the building up of God’s people—reaping an eternal harvest in the process. There must be many forgotten Christian labourers like Sharpe in the early history of Australia and this is one of the great encouragements for contemporary evangelicals—we learn from those who have gone before us and whom God has used ordinary ministry to do extraordinary things. The second book is the autobiography of a much more famous English evangelical, J.C. Ryle. 2016 marked the bicentenary of the birth of Ryle who was a nineteenth-century preacher, author and, in 1880, became the first bishop of Liverpool. He was a national figure well before he was elevated to the episcopacy and, as a legacy to his children, in 1873 he dictated an account of his early life and ministry. A poor third-hand copy was published in Pennsylvania in the 1970s, containing numerous errors and omissions; but Ryle’s original manuscript had been “lost” for half a century until recently rediscovered by Andrew Atherstone with Ryle’s great-great-grandchildren. Here for the first time, we have an accurate, comprehensive, critical edition of this important text. This is a personal account of Ryle’s own experiences where he provides a self-reflective assessment of his life from his childhood through his conversion to various parish ministries. Ryle is open and honest in this autobiography about many of his priorities and struggles. Having grown up as the heir of an extremely wealthy family, he gives us insight into the disappointment of thwarted expectations as he describes how the family was ruined and became penniless. He explains what life was like for nineteenth-century clergy in England and the desire he had for winning souls for Christ. The autobiography speaks about his first two marriages where he was left widowed with a young family and the struggles he faced in relation to this. In all of these things, the reader is given a fascinating account of a great evangelical spokesman. 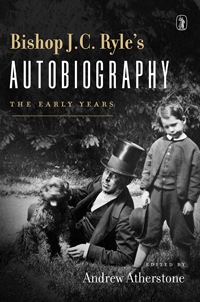 The autobiography is enhanced by Atherstone’s critical apparatus which provides explanations of people and phrases that would have been understood by Ryle’s children but are unfamiliar to twenty-first-century readers. These two books should not just be considered of interest to nineteenth-century aficionados. They will serve to edify contemporary evangelicals by the encouragement of those who have gone before us enduring the ups and downs of life and who, having been saved by faith in Jesus Christ, did not waiver in their gospel convictions no matter what opposition or hardship they faced.